A new post to chronical what is reported about the Attack Of The Show broadcast tonight. It will get updated as events unfold. 7pm (est) - Show has started, no updates yet. 7:30pm - Davide told us that the poster information is updated to say "This poster is on black paper", which is an update to the screen shot that was initially captured. Has anyone else noticed that the Sold Out sign has moved on the Locke Poster. It is now at the top, where it was in the middle. Ha. I posted exactly when you launched NEW POST. Afternoon. Ready? I'm ready, although I'm not sure it will be very exciting ! It would SEEM like they are handing this one to us without much mystery. I am not taping. R u? #tmag25 #aots #lostARG #ReverendMilo one of them bound to catch. new DVDuesday Full Grown Men, . . .
sorry not watching. here's the text holding the spot. Film expert Chris Gore is back with three new DVD releases that you should buy, rent or pretend like it never existed. Today, he reviews Full Grown Men, Second Skin and The Union. Almost time to get our next url. I'm not taping as I'm in the UK and can't get the station. Not unless I have a very large satellite dish. I'm taping in case I don't hear correctly. But I'm sure it will be up here and Zort will have it on the front page before I can blink an eye! I will be following the show, if you would like Twitter updates, (if you are out on the road or whatever), you can follow me @dasituationroom Thanks! Full Grown Men ;They've got their whole past in front of them. Second Skin - "the first feature length documentary about virtual worlds and the gamers who live in them"
The Union - Marijuana documentary, ends with quote "through the looking glass"
Yeah - am taping and will post comments here and on twitter. Watch the feed at the bottom too. Is it safe to say that the website won't appear till the DVDuesday segment? All I've got to say is TPTB owe me big time for making me watch this show. Sayid'sgirl: I was thinking the exact same thing! People actually watch this because they want to? No offense to anyone! LOL I just chatted to my brother "This is the first and only time this show and G4 will ever be on my TV"
Sounds like the show isn't to everyones taste. Maven, the poster may be up quicker than that. Come On Guys The Show is actually pretty cool, and besides they rebroadcast it at four am while I'm getting ready for work so I guess that's why I watch it. Hi David, how's things ? Good Zort... Steve and I were working on a new podcast and I accidentally lost the audio.. He and his wife are probably gonna have a baby this week. Commercial for a "Two Months, Two Million" - not sure if it is a real show. Had a website 2M2MM. Wish Steve and his wife all the best. Alright that was a stupid bit!!!! I have one of those disintegrating in back of my house. How was it revealed ? Not my favourite so far. There is a segment called "around the net:. The site flashed on the screen. I seen the url scroll by as I was looking back at the tv when I was reading posts. So I missed the first part of it all I seen was something about a net. I thought it was it but wasn't sure. I heard the girl say it and then wewerecaughtinanet.com was shown on the screen.. sounded like Lost. I'm not watching very closely. I dunno, the whole 15 lost, 1 found. I thought it had to do with characters. Maybe since it says 'on sale soon' because it's a decoy...maybe there's a hint coming on Dvduesday...long shot but you never know! Do we still have to watch the show? The posters are about watercooler momments. @Anonymous I think it always says "on sale soon" right after it has been anounced. they're not meant to be character posters, they're posters inspired by iconic parts of the series. Dharma van certain is an icon! keep watching they might decide to give us two posters this time...or even something else! 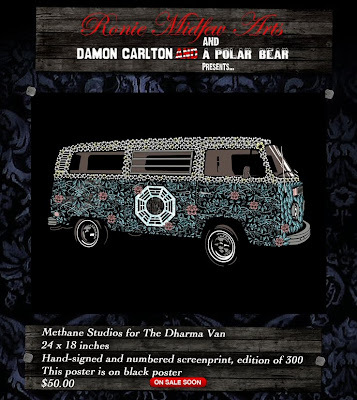 OK, I'm OK with the Dharma van, but made of flowers on a solid black background? Who was the artist behind this? They don't even say, just "Methane Studios"
I haven't really been following this stuff very closely. Is it pretty much just selling the posters, then? And they give clues beforehand to know where to look first for them? Does anyone know how long it was before the Locke poster went on sale? I was on th way back from the Boston thing so i never got to it until it was already gone. If DVDUesday is on and nothing announced, then why all the clues pointing to it ? Eugene, I'm pretty sure the Locke poster was online for several hours before it sold out. Zort: It could be just to show it was going to be Tuesday's show. That's the special segment of the day. The url was shown just before the DVDuesday segment. in the screen you have on they say "this poster is on black poster". wow, sounds like ya'll didn't like AOTS...kind of glad I can't even get it! Not sure what to think about this one....the Locke one had to grow on me, maybe this one will? Or maybe I'll wait until next time. This one looks kind of glow in the dark like the Hurley one, wonder if it is? 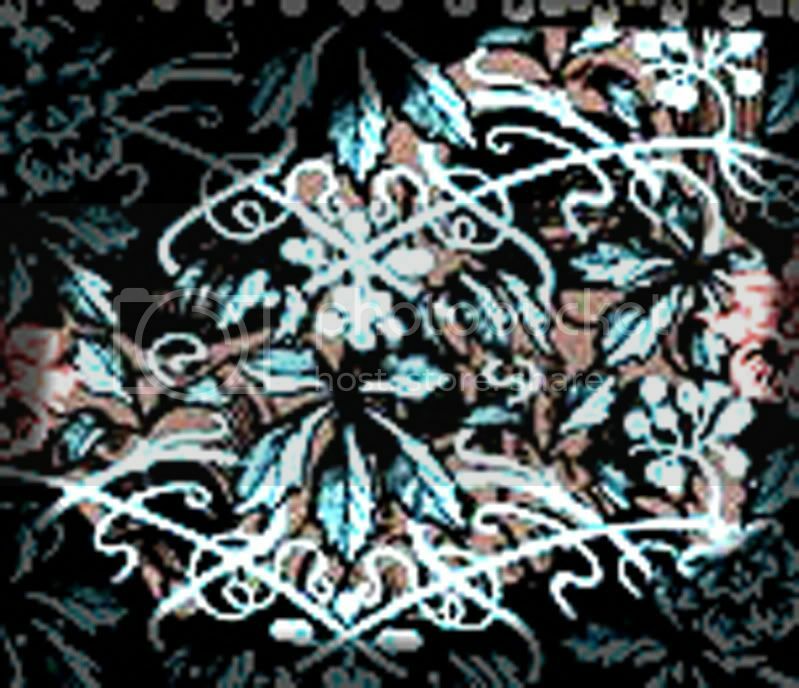 Black Swan, yes that is pretty much it, however there are some underlying puzzles that are not resolved yet. Eugene, I think the Locke poster went on sale about 30 minutes or so (maybe less) after it was revealed. It sold out the next day I think. Mark McDevitt and Robert Lee artist at Methane. Other poster designs include Dave Mathews Band. hmmm...this one is horizontal...think I want to go for the vertical ones, so I can hang them together. Thanks for the info. So I have a shot. I actually like the Dharma van. Thanks Zort.. I should try to catch up if there are puzzles to this. 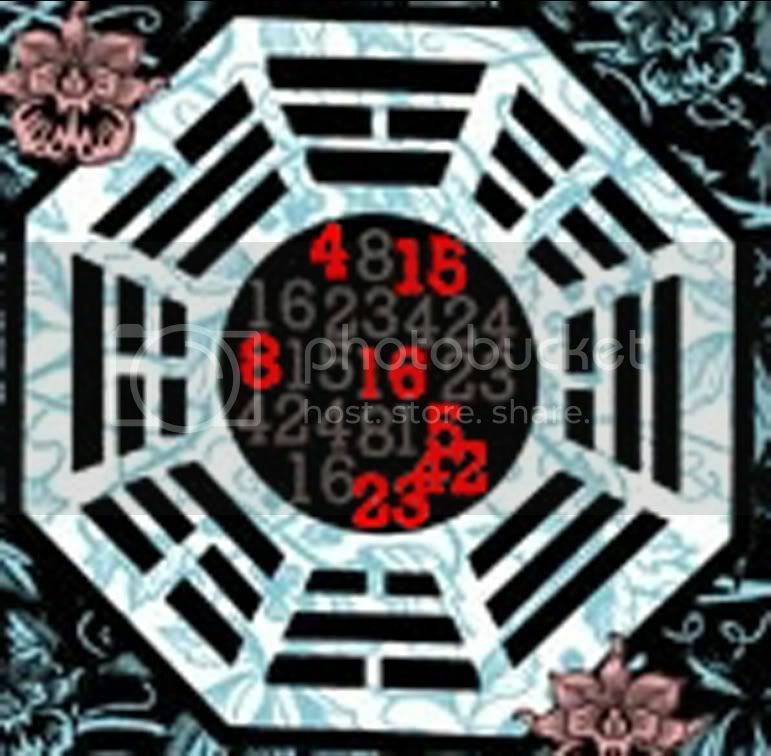 I noticed inside the bagua on the van the numbers are there and an extra highlighted something.. is it an "S"? Tim, I can't move the van with my copy of Firefox. They just showed wewerecaughtinanet.com again. Guess it is the only link that they post tonight. would it be 1-1-1 because it's the third poster? It looks like an S above the number 42 inside the bagua on the van door. What else is differnt. NO copy, no mention of LOST, etc. I'm on firefox and can only see a shadow of the van move when I click and drag.. probably because it's a gif file? BlackSwan, I think it is just the 15 from the sequence before. Firefox 3.5 - nevermind, all of the poster images move. why would it be highlighted, though? The poster does not resize well at all. I'm on Firefox and I can move a copy of the poster around. i got one. not sure what number. Start buying people...it's on sale! Says my order number 327. Scoutpost & LotteryTicket.. looking at your avi's, I'd say you are related somehow.. ROFL! I think I got one. Every time I tried to check out it told me that it was aduplicate order. Finally got an order number though. heh heh Eugene...duplicate order, just like your duplicate post! ;) Glad you got one. I think I'm going to sit this one out. Eugene, everything is duplicating for you at the moment ! I think I've got funds for a couple of posters, but this isn't one of the ones I'm going for. I was very close to getting the Locke one, but I left it too late. I'm order # 335. I had to have the Dharma Van that was one of my favorite episodes. Ok, so now that's done...ready for the next clue! Yes. Darn computer is giving me fits. It keeps freezing on me. I think I better go finish the dishes. Well, if that's it for today then I'm going to bed, got to get up for work tomorrow and it's nearly 1am here. Congratulations to all that got their poster and for those that didn't here's hoping that the next one is more to your taste. Reverend, expect a 'first place ribbon'to go with that unbelievably fast ordering! 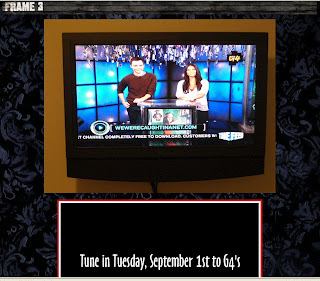 A new image on the hub page of the caption on the screen during the show. Definitely going to bed now. Yes good job ReverandMilo I was trying to be first but my computer like Eugene's was giving me fits. Ah well. I'll still have that cool Dharma Van that relates to Hurley to me. I used my iphone battery up refreshing after the url went up. Scoutpost.. ah, Mad Men! I don't watch it, but my daughter just loves that show! g'nite, Zort! You're doing a marvelous job here! Sayid'sgirl, glad you got it! That's a very groovy poster, but not to my liking (or rather my VISA's) so I'm passing. I might fork out for a Faraday if one turns up. Good luck everyone in getting a DHARMA van! And great work everyone! Well if they've got one focused on a Dharma van I think it's a pretty sure bet there will be one with smokey featured. :) I was figuring it would all be character centric until now. As for this week's. It's nice. 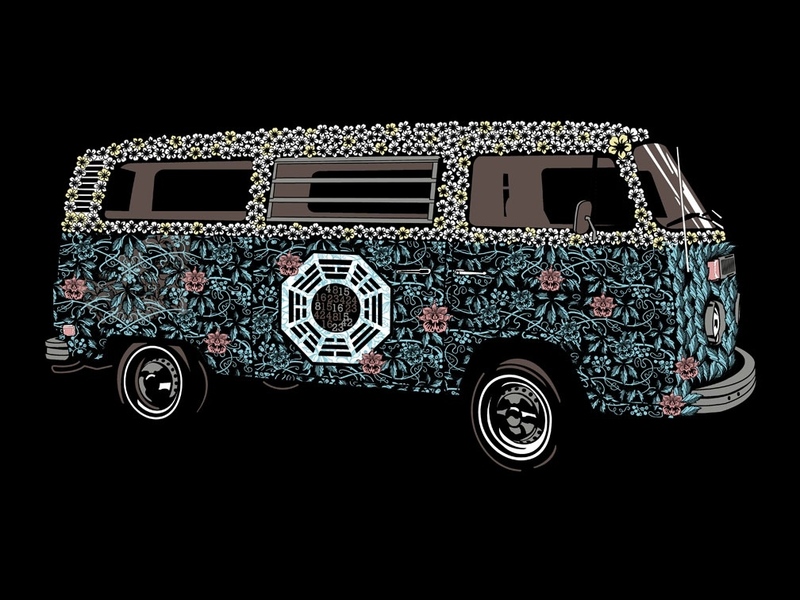 It's a very cool take on the "flower power" of the VW mini bus and the Dharma Initiative ethos. Only gripe for me is the numbers inside the dharma logo, which I think distracts from the larger "thrust" of the van's role in Lost. ...as for the G4 thing... I applaud their ability to coordinate and orchestrate all this... but even for someone participating from home it's more fun to read/hear about people lining up for cupcakes or getting wasted in a club in LA than it is to watch TV (which most people at home are doing anyway) :/ ... so here's hoping for more in-person events going forward. Well, now that we've seen that the posters are not limited to characters, I think we should be watching for storyline clues rather than simply basking in the beauty of the art. I'm thinking that maybe the line-up of the posters will tell part of the story, i.e. Locke and Hurley are going to ride in the VW bus or something like that. Also, I think we should be taking note of the various web addresses, maybe they will connect together @ the end or maybe we will see them pop up in dialogue during season 6. The van almost is a character in it's own right. I can't imagine Lost without it now. If there is anyone that has received their Locke poster then could we have any closeups of the poster ? The bottom wording and symbols especially. I think the numbers are on the van because of the episode Trisha Tanaka is Dead. When Hurley got the van started and decided to have hope and believe that he wasn't cursed by the numbers. Sayid'sGirl - do you think the numbers will feature on every poster ? They weren't on the Locke poster were they? I haven't gotten my Locke poster yet, but I'll post the info here when I do, if no one else has by then. I didn't know you ordered a Locke poster. I must have been asleep that day. I haven't received my Locke poster yet either, but ditto capcom, I'll post pictures when I get it if it's not old news by then. You know the DCAAPB site says, "...were commissioned to create artwork celebrating one of the series' most memorable, and unforgettable, "water cooler" moments." Morning all. I haven't received poster either. Poster 1 Hurley centric, has numbers, and quote "A curse. A curse upon your clan! [not LOST cannon] site: itsactuallyketchup.com, Hurley to 'not real'Anna Lucia epi: 5.02 (88) "The Lie"
Poster 2 Locke centric wheelchair & knife, site: thatandbasketweaving.com from Alex to Sawyer, epi 3.07 (56) "Not in Portland"
Poster 3 Dharma van with logo and numbers, site: wewerecaughtinanet.com Jack to Sawyer, epi 2.22 (47) "Three Minutes"
If there is a pattern here, I don't see it. That would be so cool! I was hoping to first to get what ever extra gift comes with this one. My hope Dharma Beer! No I don't drink, but it would be cool. Or a Roger Workman skeleton. I guess that answers your question zort. Looks like maybe all the posters will have the numbers somewhere. That's good that you at least get a free gift with that one. Number are below the "trim lines" in this image. It will be interesting to see if they appear on the posters that are sent. Also, order of cast members is alpha with the exception of de Ravin. She is listed before Andrews. Poster sponsored by Oceanic and Dharma. A Jimmy Wellington sent the blog an email saying he recieved a print of Damon Carlton and a Polar Bear for being the first to order the Hurley poster. So I'm presuming that all first orders will get an extra gift. It would be cool if they do. Also, is it just me, or is there a SKULL hidden in the flowers on the left side of the van?! Could it be ROGER?!?! Steve, I'm positive that it is just the 15 in the sequence, the 1 and 5 are different colours and that could be some significance. 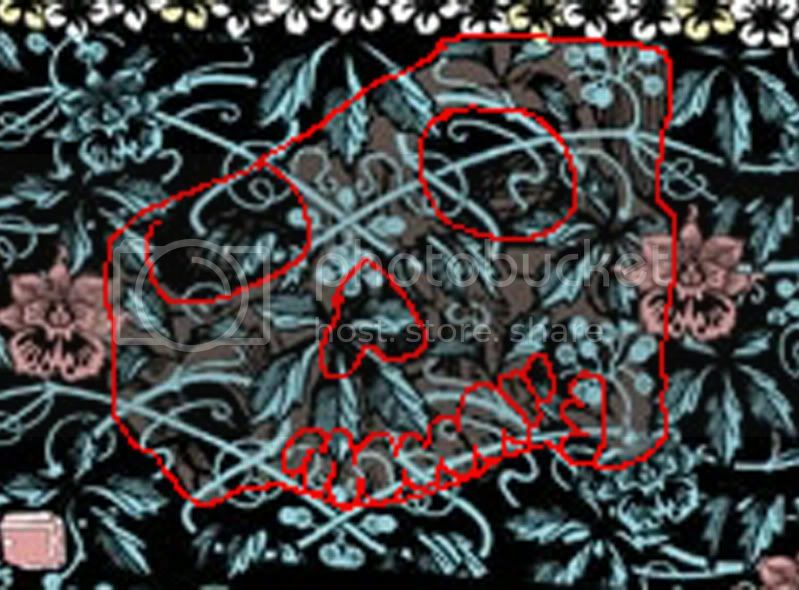 I see what you mean about the skull, it does look as though there is something behind the flowers. Thanks for the link, I see the numbers there, so I subconciously knew they would be there ! Although this is quite a large size, I would still love a higher resolution version when it arrives. It doesn't say if the poster arrived at the same time. Sayid'sgirl - what would be the extra gift in this case though ? A toy Dharma van model painted in the same way ? Has anyone commented that there are 16 footsteps on the Locke poster ? I'll stop posting now as that's four in a row. Has anyone noticed the icon of the new website? Thanks zort for finding that comment. I'm not sure what an extra gift would be if there is one at all. Maybe your suggestion. Maybe a dvd of ATOS NO!! lol Could be a Hurley figure, which I already have. Actually it's my daughter's. I don't know it's hard to say. You can definitely see a highlighted extra 5 in there, along with our normal "4 8 15 16 23 42"
Hi there! I'm the one got the skateboard deck. It arrived a day or two before the print showed up. Not sure where to post a picture. That's definitely not a skull. You shouldn't have to look for Roger, he should be behind the wheel. I think he would have been a nice touch. Deneph, you can email them to the Admins@lostargs.com email address if you have any for us. Also, in this pic (closeup of Dharma logo in latest print): link there's a space after the 5, with room for what looks like possibly another number... Possibly with a blacklight, or if it glows in the dark, another number would be revealed? I think you guys are just overthinking this. The artists on this poster just did a bad job. I'll stand by my Skull theory though... I see Roger in there, peeking at us! Not great pictures of skate deck and letter on their way. Can't wait to find out what the next first customer gets. Good luck! Actually, it might be a skull facing the other way? I've created a new post (non commenting with the pictures of the bonus deck and letter. The numbers on the van does stand out as a particularly bad screw up if it is not deliberate. Maybe this was a draft of the image and they corrected it for the final poster prints ? We will see when they arrive. The only thing that I can see that might be considered wrong with the numbers is the 5 is a different color than the one. But there isn't any extra numbers. @Sayid'sgirl - The thing is, there's only 1 instance of the numbers being highlighted. The sequence IS in order, as you've typed it, but only 1 instance of each number is highlighted, except for that 5 that is the same color as the highlighted set. Hopefully Zort is correct and it's a screw up on an early version of the print... Otherwise we have a pretty bad $50 mistake... OR, it's a clue. I guess I'm easy to please because it doesn't bother me. comment re: Ronie Midfew Arts letter. Are these letters being sent with each poster? Can they be considered part of the fun? Should be ask the owner of the velvet painting if he received similar? Ok I see what you're saying now. But it still doesn't bother me. I'm not sure it's a mistake. But the only one who knows for sure is the artist. I think the Ronie Midfew letter is only for the first order poster. The different colour wouldn't put me off if I liked it enough to buy this poster. I only got the letter with the board, I didn't get any sort of letter when I ordered the Hurley print. Good point Socutpost about the "moments", I hope that there's a Statue poster, even if I can only afford to print it out from the online version to have it. ...quick thought...remember ronie midfew arts translates to windmore fine arts...wouldn't it be cool if some of these prints turn up in season 6 of lost. That'd be sweet!! I actually thought of his neck breaking skills. But it probably wouldn't work on a poster. Or the death by dishwasher. eek! Some him and Nadia would be good though. Yes, Anon, I'd love to catch a glimpse of one during the season. To have it displayed full frame and close up would be too much, but just a part of one or two in the background would be great. Talking of the possible skull, on the Methane Studios pages there is this possible match for the outline that Steve drew and linked to above. It is the one entitled Peace Skull on the right hand side when the page loads. Sayid'sGirl, I was trying to think of a possible Sayid moment as well, and apart from beating up Ben (then again who hasn't) I wasn't sure what itmight be. If I were producing one, my concept would be of a peaceful Sayid in the center (meditating ?) with lots of chaos going on around him. that was the exact thought I had of him too. him meditating. Zort - Nice find! Looks like a similar skull to me! Hmm, so did they repurpose a skull from a previous work? Or is it just that their skulls look similar? Still not sure about that 5 though... What's the significance?! Sayid? I always thought of him as a tormented lover. A poster in a 007 Bond vein would be nice. Here is a tribute I did for Sayid couple years back. I get teary when I think of Sayid, but I chuckle when I think of Naveen. Interesting Steve, and as an artist I would tend to agree that authenticity should be important in representing someone else's concept. But I guess that TPTB gave these artists some creative leeway and this is the interpretation that one of them came up with. ??? @thin: after the economist aired there was a really cool mock poster of Sayid floating around titled "The Jarrah Identity" -- I'm really curious what they'll do for Sayid... it better be badass. Damon has said the 'Numbers' meaning or deeper mythology will not be explained, though after that statement the TLE ARG revealed the numbers to be the core values in the Valenzetti Equation. Since we know that Dharma was experimenting with 'time', could the Numbers be someway tied to time? Also in the Abrams Wired Magazine cover, the issue date was next to the reversed phrase "Crack the Code"
Haven't the first 3 posters had URL's associated with Roman Numerals? I don't think we are now experiencing a full blown TLE like ARG, with this Poster art, but maybe some clues are being presented that are not in the artwork, but just below the surface. Something to do with 'time' or 'dates' ??? oh well, enjoyed belatedly reading all the posts, anyway! Hi Ellen, there have been quite a few comments to get through. thin - there may well be something bubbling under here, but I'm not sure we have enough information yet to make even an educated guess on what it might be. So thin get your puzzle soving parts in gear. I was going to suggest you email Mr. Wellington to see if his letter has any typing errors but see you already made a post requesting that. I followed the link to lostpedia but could find the letter. I always have a hard time navagating that site. Was there any errors in his letter? I can't see any obvious mistakes and it is similar in style to the second print letter. Alexandra Miller finishes the letter in both cases as "Best and Thank You" not something I've every used on a letter. It's about lunch time here, and I still can't type. Duh maybe I should learn how to use the scroll wheel on my mouse. While we wait. Here's how to make your poster come to life. Not a Band combo... Geronimo Jackson?